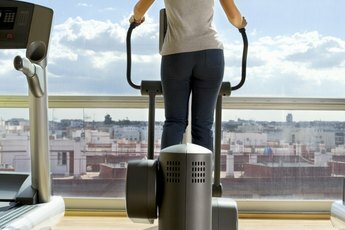 A stationary bike allows you to burn calories in a low-impact environment. According to Andy Applegate of Carmichael Training Systems, an indoor bike can provide a harder workout than an outdoor bike because you are fighting the resistance of the trainer. A stationary bike provides a low-intensity workout in an indoor environment and you can customize the workout for your fitness goals by adding or reducing the resistance. When cycling, you work out your heart and lungs, strengthen your leg muscles and burn calories. According to "Bicycling" magazine, cycling provides a solid workout for individuals who are trying to lose weight because it is nonweight-bearing sport. This means individuals can ride longer than they can walk before feeling exhausted. 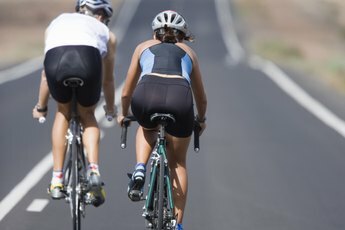 One of the most effective weight-loss workouts on a bike is intervals. By alternating fast, powerful bursts with easy recovery periods, you can burn more calories in a shorter amount of time. To lose a pound of fat, you need to eat 3,500 fewer calories than you burn. The Mayo Clinic recommends that you cut out 500 to 1,000 calories per day through exercise, a lower-calorie diet or a combination of the two to safely lose 1 to 2 pounds a week. Additionally, the Mayo Clinic states that diet has a stronger positive effect on weight loss than physical activity. If a 160-pound person rides a bike at a leisurely pace for an hour, she burns 292 calories. If that same person stepped it up to a moderate pace, she burns 634 calories. To build endurance and scorch calories, try Lance Armstrong’s former coach Chris Carmichael’s 60-minute weight-loss interval workout. Begin with a six-minute warm-up and then pedal in an easy gear as fast as you can for one minute. Then pedal easily for one minute. Repeat this whole set one more time. Next, do five two-minute intervals where you ride as fast as you can with moderate resistance. Do two minutes of easy pedaling between each interval. At the end of these five intervals, ride easy for six minutes and then do the set of five intervals again. Finally, cool down for eight minutes. By paying attention to form and technique, riding on a stationary bike can be a safe sport. To begin, make sure the bike is properly set up specifically for you. To adjust the seat, stand next to the bike and make sure the seat is level with your hipbone. Slightly angle the seat forward to maximize power and reduce back tension. Adjust the handlebars so they are slightly higher than the seat and make sure you can reach them in a relaxed and comfortable position. Only add as much resistance as you are comfortable with and make sure it is never so hard that you cannot pedal in a fluid motion.